Neurology medical billing rules are updated each year, and it is necessary to stay on top of the latest guidelines to avoid losing payments. Reworking incorrect claims that are declined by payers can increase administrative hassles as well as operating budget. If you want to focus on patient care alone, outsource neurology medical billing to a dedicated billing partner like us. If you are under-resourced to handle patient care alongside neurology medical billing services, turn to Outsource2india. We are an ISO certified neurology medical billing company with vast expertise in ICD-10 PCS and even ICD-11 coding systems. Our AAPC and AHIMA certified medical coding and billing experts can process accurate claims and multiply your collections in short TAT. Did we mention we can do all that within your budget and in high pressure timelines? What are the Neurology Medical Billing Services Offered by Outsource2india? We are the go-to partner for many neurology physicians, hospitals, and clinics when they want to outsource neurology medical billing solutions that are critical and need to be executed within predetermined time at budget-friendly rates. Our specialized neurology medical billing services are customized with your needs in focus. Our billing practices are focused on one objective - fattening your collections in short TAT. Being an experienced medical billing company, we understand your billing requirements better and know how to improve your payment capture through HIPAA-compliant, error-free billing methods. We send valid invoices to payers so that you can get paid faster without facing the risk of claims denial. When claims come back denied, it can upset neurology providers so much so that the mere thought of reworking the claims can be overwhelming and disconcerting. This could be you if you are unprepared for denial management. We have a dedicated team with know-how of healthcare revenue cycle and claims process followed by major insurers. From rectifying errors to rechecking the claims, to transmitting claims once again we are the right people for the job. Routine instances of delayed payment or nonpayment can be bad for your revenue cycle management. Outsourcing AR follow-up to us can let you sit back while we pursue uncollected payments and post captured funds to your account. We also send routine reminders to payers and collect reports on claims status. If excessive paperwork is coming in the way of efficient claims process, leave your worries to us. We provide credentialing services where our specialists establish the eligibility of your patients to see what procedures are covered by insurers. We take a closer look at patient profile and well as insurer policies to discern if the former can avail certain neurological procedure, diagnosis, and treatment as per insurer guidelines. When patients avail neurology procedure not covered by insurers, providers have no option but to follow-up until dues are collected. This can become a burden when there is a bottleneck in uncollected payments. To avoid such hassles, getting authorization in advance can help maintain harmonious relationship between providers, patients, and insurers. To reconcile the claim, we collect payments in lieu of the client and post the same into respective accounts in medical billing system. The electronic remittance advice (ERA) sent by the payers are stored in the billing system as well to be used as future reference. We handle charge posting as per the client-requirement to allow write-offs, adjustments, refunds, etc. Offering billing and coding services for over 2 decades, we excel at billing and understand nuances of neurological diagnosis, procedure, treatment, revenue cycle management, as well as policies of every top public and private payers. Our proficiency in newest codes (Medicaid and Medicare), terminologies, and billing software can help to bring you reimbursements faster. What is the Process Followed for Neurology Medical Billing? Medical billing if not done with prudence could result in monumental loss of time and money. So, when clients choose a billing partner like us, they are keen to know how we handle sensitive clinical data and billing project. In its simplest sense, we believe in business transparency. When you enter into a contract with us for a billing project, we take care of the paperwork on service execution which includes signing the business associate agreement. Your neurology medical billing project will be allocated to our project team comprising of AAPC certified coding & billing professionals as well as a dedicated account and project manager. Through means of a highly secure VPN, you can transmit clinical and insurance data. You can also get access to electronic health record and document management system. Using powerful billing software, our AAPC certified experts who are also knowledgeable in ICD-10, ICD-11, and DSM-5 systems carry out coding and billing functions in accordance with HIPAA compliances. All claims are thoroughly checked to see if they meet insurer specific guidelines and HIPAA guidelines. We transmit the claim only when they fulfill all requirements. We keenly look for errors and unavailability of data in the claims that come back. We analyze and rectify patient demography and insurance data that are flawed before retransmission. we send the claims in the format accepted by your insurance provider. We file claims digitally to keep track of data on the go. You can also get quick updates on claims status from insurer's end through our reporting service. 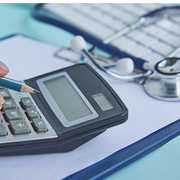 Why Choose O2I's Neurology Medical Billing Services? Save up on cost by outsourcing neurology medical billing because we believe in providing services tailored to your need. After all, why pay for what you don't need? The client was a first-time outsourcer, and the main concern was centered on quality. The client's existing billing team had an error rate of 4%. Our team had to work within an error rate of 2% by acquiring training on specialized software as well as methodology. Read the case study. I wanted to inform you of what a great job O2I is doing for our firm. Vinoth Kumar and his team have done amazing work and are extremely reliable. We definitely consider O2I a part of our strategic plans moving forward. Initially, we needed to get a feel of your services and expertise in order to move forward on other enterprise accounts, and now we have the confidence in doing so. Thank you to you for all of the help over the year! Outsource2india is a trusted provider of neurology medical billing services in India with 20 years of experience in medical billing & coding services. We are a HIPAA compliant & ISO certified company which has many global delivery centers where your billing requirements are handled with care. With a team of 100+ AAPC certified coders, billers, and subject matter experts, we assure you nothing short of a better client experience. Our Neurology medical billing is a cost-effective service that you can afford without stretching your budget. Our streamlined workflow model guarantees faster reimbursement with less time spent waiting.